Every year as the holidays approach, community association owners and renters become passionate about two issues: decorations and snow removal. With some forethought, boards of directors and managers can avoid conflict and liability around these issues. In most communities from Thanksgiving until just after the first of the year, and around other holidays throughout the year (Halloween, Easter, Valentine’s Day, Purim, etc. ), owners and renters begin the process of putting decorations (of all colors, sizes and shapes) on their property. These include everything from a miniature Fenway Park for the World Series to a tiny Mount Rushmore on President’s Day to a 24-hour-a-day brightly lit and noisy Christmas tree with Santa wishing everyone in the neighborhood a Merry Christmas and Happy New Year at very high decibel levels. Many communities’ covenants prohibit “any exterior change or alteration of any nature without the written approval of the Architectural Control Committee,” but taking a Scrooge-like attitude to require approval of these decorations is not recommended. Timetable for Decorations: The guidelines should spell out a reasonable period both shortly before and after the holiday for decorations to be displayed that are consistent with reasonable and customary practices. 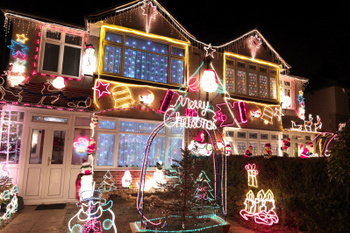 Holiday Lighting: Lighting (especially bright and blinking lights) should not be allowed to disturb neighbors. Blow Up Decorations: The association should address blow up decorations specifically, including issues such as whether decorations may be inflated all day, how large they may be, etc. Common Area/Element Decorations: Sometimes the association itself places holiday decorations on the common areas of a homeowners association or common elements in a condominium. The association needs to be conscious of a potential claim for a violation of the Fair Housing Act (FHA) and other federal and state fair housing laws. Associations must not favor one religion over another and they have an obligation to be non-discriminatory and uniform in the application and enforcement of holiday decoration rules. While common area religious displays either should be avoided or carefully monitored, residents of the community should be allowed to display personal religious items in their homes and on their property within the association’s holiday rules and regulations. My favorite real life war story is the homeowner who installed red and green Christmas lights that he kept in place until mid-January. When the association sent a letter asking him to remove the lights, instead of removing taking them down, the owner replaced them with pink lights for Valentine’s Day, which remained until early March; they became green for St. Patrick’s Day. The cat and mouse game continued throughout the years with red, white and blue replacement lights for July 4th, orange and black lights for Halloween and everything else in between. It ended only when the owner moved.